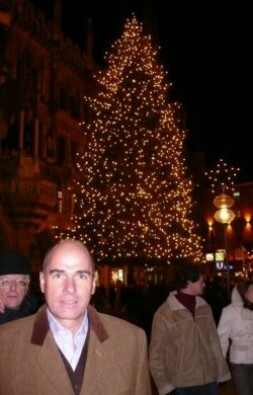 German entrepreneur and geostrategist Dr. Hubertus Hoffmann, Founder and President of the World Security Network Foundation, at the traditional Christmas market in Munich: "Together, let us dream of a more peaceful world in the New Year. Let’s dream of peace on Earth in 2007!" In many parts of the world—just like here at the traditional Christmas market in Munich in the heart of Bavaria—Christmas is a very special festival for reflection and the heartfelt wish for peace on Earth. We all know that the real world is more brutal, inconsiderate and violent than we would all wish at this time. But should it stay that way? a time to sympathize with the weak and needy. 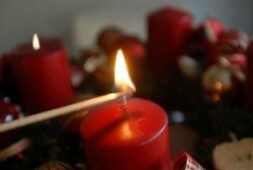 Christmas time is a worldwide occasion for reflection, which has come to extend far beyond the membership in the Christian religion—it is a candle which shines its light around the world. Together, let us dream of a more peaceful world in the New Year. Let’s dream of peace on Earth in 2007! Peace in Darfur – an effective intervention of UN forces, the establishment of a no-fly zone and the end of the genocidal killing of the black native population. In Iraq – the beginning of a policy of reconciliation between Sunnis, Shiites and Kurds, who will be able to decide locally, independently and democratically on their children’s future within their own autonomous regions. The fair division of oil income according to the population, and thereby the containment of hatred and violence. In Afghanistan – the realization that a reconciliation between clans is in their own best interest, but not however a revival of the radical Taliban. A new policy of local dialogue with the inclusion of the Pashtun tribes and a regional peace agreement between NATO and clan leaders. In both war-torn areas a priority of visible development in the country and an improved military-civilian cooperation, so that the people see that they are now better off, as well as a wise, limited application of military power as an ultima ratio regis. Israel should finally begin a historically necessary policy of reconciliation with the Palestinians and Lebanon which, as a double-strategy, meaningfully supplements power. Through symbolic steps on the part of the government, along with many thousands of grassroots projects, Jews and Arabs should extend a hand to each other thereby eliminating hatred and killing through a gradual policy of reconciliation and hope. Reconciliation is the water to extinguish the flames of terrorism in the Middle East. "Christmas time is a worldwide occasion for reflection, which has come to extend far beyond the membership in the Christian religion—it is a candle which shines its light around the world." The West should not focus on the radical Iranian President Ahmadinejad, but rather on the people of Iran—a primarily young generation who want peace and freedom and who have been hindered by Mullah dictators for the last 26 years. Let’s liberate the people from their bonds! We need a policy of a thousand international contacts in business, politics and culture—for precisely this reason no isolation and no sanctions. We still have time for the desired regime change in Tehran because, according to Western intelligence analysts, the creation of a credible nuclear arsenal in Iran will still take five to ten years. Solidarity with dissidents in Cuba and the convening of a free parliament in exile—for example in Spain—based on the example of the grassroots Esti Committee in Estonia, so that this long-surviving dictatorship will finally be brought to an end. In the U.S. a rolling consensus to establish and implement a new, credible and effective Global Double-Strategy of Power and Reconciliation in American foreign policy. A new gleam for the torch of freedom of the Statue of Liberty in New York which, with a positive radiance and global credibility, will shine forth the traditional American values of freedom, progress and human rights. A departure of the White House and the Pentagon from a security policy consisting of maximum power and minimal human rights in the struggle against evil. Only through a balanced, globally accepted policy can we effectively contain evil and defeat it long term. Only when the means and ends appear morally equivalent and thereby credible will the many thousands of good-hearted people from all over the world join in solidarity with the U.S. in the fight against terrorism. A clear sign of tolerance and good will between Christians and Moslems. We need cooperation between people of goodwill of all religions and an active joining together of the global elite for peace. The Codes of Tolerance Project of the World Security Network Foundation will focus on this area in 2007. The receipt of sufficient power to defend oneself avoiding Provocative Weakness—this is indispensable as only through the use of this power can terrorists and dictators be deterred and peace in freedom be maintained. It must be included as a source of power in a credible double-strategy along with the necessary policies of reconciliation. A wake-up call to the elite and silent majorities in the 200 countries of the world, actively shaping a better reality and not leaving foreign and defense affairs to bureaucrats, to mediocre politicians or radical fanatics: "We are the world—we have to save our world!" An active global discussion on Moral Relativism—the greatest danger confronting our world—which ultimately denies all absolute values. No longer able to believe in God and without religious grounding, it clings nihilistically to pure opportunism and materialism. The more materialistic our societies become, the more soulless they are. Humanity has a deep inner-desire for absolute values, not merely the material. In the absence of positive deeper values, emotions and inspirations, we surrender the world to the power of negative influence. The spiritual, responsible global elite should fill this spiritual vacuum and confront the dangers of Moral Relativism now. These are but a few of our dreams for a better world of tomorrow. If you would like, please join the World Security Network now, making your dreams of a better world come true! I wish you and your families a Happy Holiday Season, Merry Christmas and a peaceful and Happy New Year in 2007! HOW CAN THE US DEFEAT ISIS?